Starting in 2016, BEACON began collaborating with three scientific societies (ASN, SSE, SSB) to continue support for a variety of outreach opportunities that needed a new home after NESCent ended. 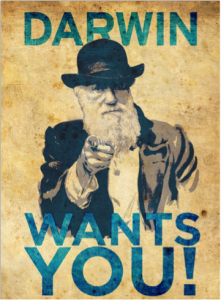 Today we’re highlighting one of these opportunities – the Darwin Day Roadshow! The roadshow is a way for scientists and educators to share their excitement about the science of evolution. 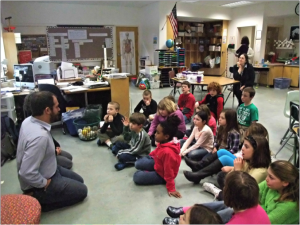 Each year around the time of Charles Darwin’s birthday (February 12), teams of scientists talk to students, teachers, and the general public about their research in evolutionary science, their career path, and why evolutionary science is relevant to everyone. The roadshow has visited over 24 states so far since 2011! We are currently planning for the 2017 Roadshow and are looking for local hosts, typically teachers! These hosts – known as ‘Darwin Day Scholars’ – work with the roadshow staff and scientists to design a set of activities that best serve their school and community. If you are a teacher or know of a teacher who may be interested, we invite you to read more about the roadshow on our website. The deadline for host applications for the 2017 Darwin Day Roadshow is Friday, December 2, 2016. HOSTS APPLY HERE! If you are a scientist interested in participating in the roadshow, we would love to have you involved! Please fill out the ‘Roadshow Scientist’ application form HERE. The deadline for scientist applications for 2017 is Wednesday, December 21, 2016. Any questions about the program can be directed to Alexa Warwick. This entry was posted in BEACON Researchers at Work, BEACONites, Education, Member Announcements and tagged BEACON Researchers at Work, diversity, Education, Outreach, Research Experiences for Undergraduates. Bookmark the permalink.